Amongst the blondes and the barrage of Brits at the Oscars last night, was a bona fide Bollywood contingent. A. R. Rahman was going to be there to perform with Florence (she, without The Machine in this instance) – that we already knew. Incidentally, Flo did butcher Rahman’s name in her red runway interview with Ryan Seacrest, calling him A. R. “Rukkhmunn”. I winced. I opened my eyes only to wince again when Jennifer Hudson did the same thing in her intro and category announcement later that night. Mr. Rahman humbly stays in the background on the Red Carpet with the woman who can't say his name properly, in front. 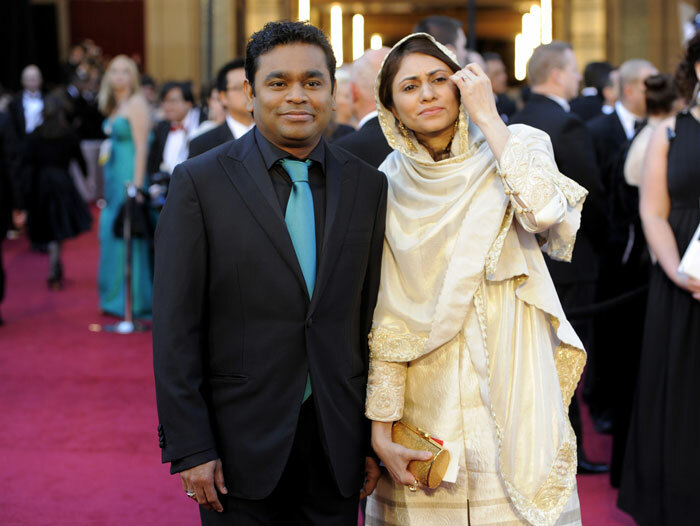 Rahman and wife, Saira Banu - in a class all their own. India's answer to a Kardashian? Mallika Sherawat at the Oscars. Anyone know why she brought the Bolly bling to Bev Hills? Is she in a movie? And of course, there is this woman – who is no stranger to laal carpets the world over. But again, I ask, why was she there? Bollywood's bronze babe, Aishwarya Rai at the Oscars, in Armani.